It’s been years since I’ve been in these mountains. 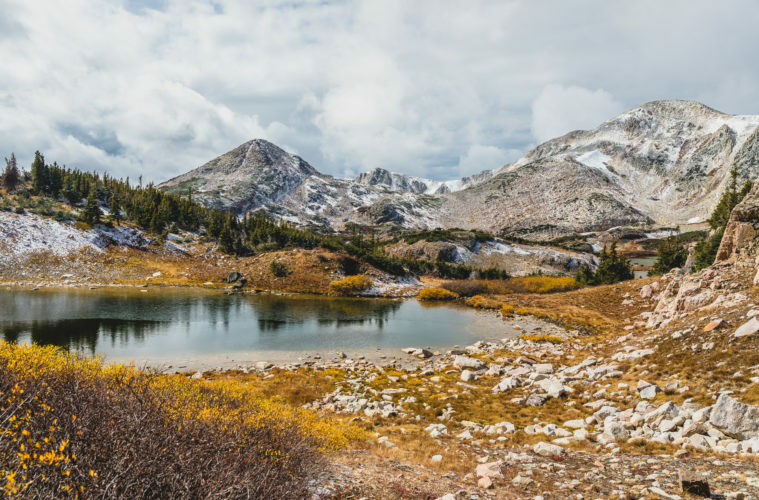 Even with a fresh dusting of early season snow, I recognize the jagged peaks and crystal clear lakes from tales of my father’s childhood — and my own. The seasons are changing here. The contrast of the rich, rustic fall colors with the pure white snow and strong blue sky is almost too much to process all at once. In the distance, a veil of low-hanging clouds parts, revealing Medicine Bow Peak. The quiet mountain demands my attention and I’m happy to give it. Pockets of fresh snow trickle down to the base of the peak, giving way to a sparkling alpine lake that sprawls out before the frozen ground I stand on. I can’t help but stare, and gaze in complete awe at the magical landscape that served as a steady backdrop to my youth. It’s been too long since I’ve been here. I inhale deeply, capturing the smell and sounds of these mountains in my memory once more before promising to return soon, and whispering goodbye into the soft mountain breeze. Photo Location: Medicine Bow National Forest.